Fibonacci series starts with 0 and 1.The third element of fibonacci series in obtained by adding the first,two elements of the series.If we need to find an element of the series we add the two numbers which are just behind it.We can generalize the equation as,the nth element of the series is obtained by adding n-1 and n-22,1 element of the series. Let us see an example…..As we know the first two elements are 0 and 1.The third element of the series is obtained by adding 0 and 1,hence the third element is 0+1=1.Therefore the series would be 0,1,1…Fourth element of the series is addition of second and third element….i.e 1+1=2..hence the fourth element is 2 and series will be 0,1,1,2…. By observing the program we need to change the values of a and b repeatedly…..because we need to add two values behind to it.In the below program the input is an integer which is length of the series. 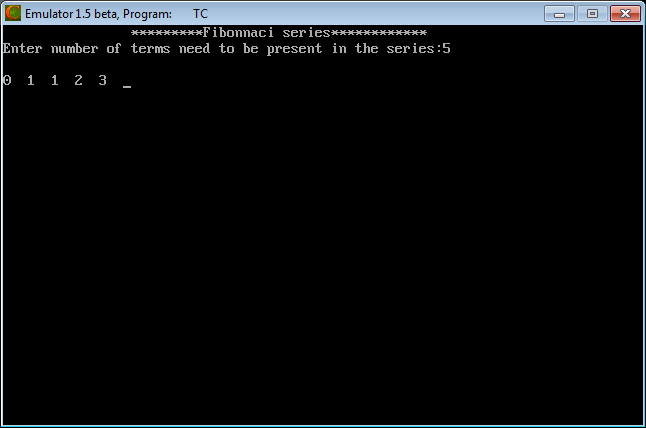 This entry was posted in C and tagged c, c program to find fibonacci series using for loop, definition of fibonacci, fibonacci, fibonacci code in c, fibonacci logic in c, fibonacci series, fibonacci series in c example, fibonacci series in c language, fibonacci series in c with output, fibonacci series in c++ using for loop, fibonacci series program in c, fibonacci series program in c using for loop, fibonacci using c, wap to print fibonacci series in c using for loop. Bookmark the permalink.